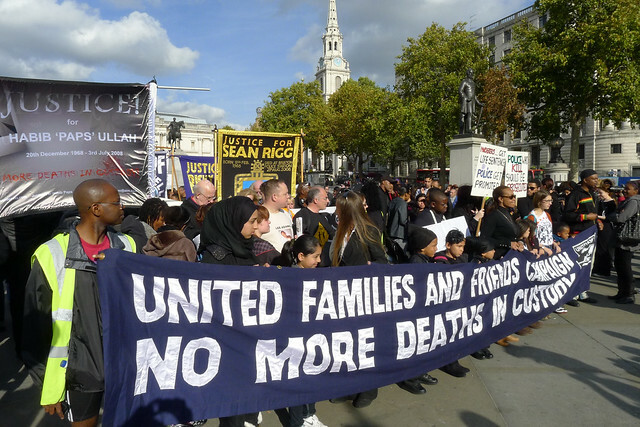 Every year, the United Families and Friends Campaign (UFFC), a coalition of families and friends of those who have died in the custody of police, prison and psychiatric hospital officials, organises a march to Downing Street. The coalition published for the march an incomplete list of 3,180 individuals who have died in custody in the UK since 1969 including 225 in the past year (pdf).The march consists of a peaceful silent procession to Downing Street followed by speeches from members of families having lost a loved one in the hands of the state. This year, the thirteenth year it happens, was no different except for the increasing policing provocations. The march went from Trafalgar Square to Downing Street via the South side of Whitehall, blocking the traffic on that side. There was still traffic driving through the North side. 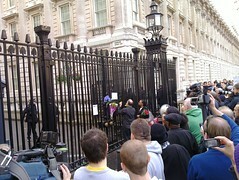 For the speeches we stopped on the South side in front of Downing Street. The police had formed a cordon to protect demonstrators from the traffic that kept flowing on the North side. Even though demonstrators were peaceful and trying to listen to the speeches, a police helicopter remained above for some time. Also during the speeches, the inspector in charge of this cordon ordered his constables to make an unnecessary step forward. Close to the end of the speeches, during the reading of the letter from the families to the Prime Minister, the inspector in charge showed his lack of respect by ordering his constables to make another unnecessary step forward slightly pushing people just when demands about how to improve policing to reduce deaths in custody were read out. 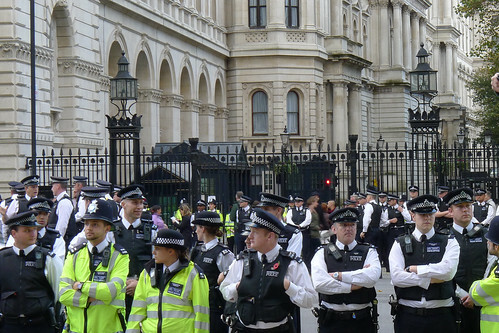 When representatives of the families went to the gate of Downing Street to symbolically attach a letter to the gate (as no one inside Downing Street is willing to accept their letter - as had already happened the previous year) police reinforcements arrived. Many of the other demonstrators than family members of those who died in custody had remained on the South side of Whitehall. Eventually most people went back to the opposite side of the road, and moved the pavement so that Whitehall could be completely re-opened to the traffic. 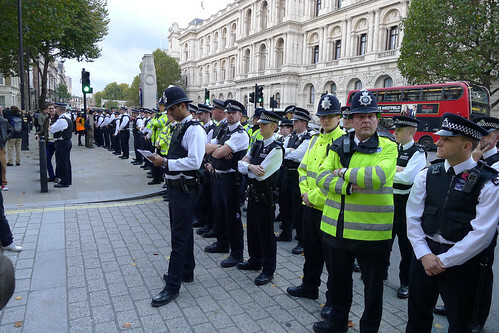 When many more police reinforcements arrived outside the gates for no apparent reason, the many demonstrators who were by now on the pavement on the South side became obviously concerned and crossed Whitehall to support the families. More officers arrived and started to push people back towards the South side. Demonstrators sat on the road to peacefully prevent this further police provocation. Officers then started a kettle. Eventually everyone regrouped on the pavement; everyone except one man who had been arrested (and eventually released alive without charge from Marylebone police station -which custody suite had been opened just for the occasion- later in the evening). That failure of State officials to ensure the basic right to life is made worse by the failure of the State to prosecute those responsible for custody deaths. That failure to prosecute those responsible for deaths in custody sends the message that the State can act with impunity. Replacement of the Independent Police Complaints Commission (IPCC) to ensure open robust transparent and thorough investigations into police deaths in custody by a ‘truly’ independent body from the very outset of the death. Officers and officials directly involved in custody deaths be suspended until investigations are completed. Immediate interviewing of officers and all officials concerned with the death. Officers and officials should never be allowed to ‘collude’ over their evidence and statements of fact. Full disclosure of information to the families. Prosecutions should automatically follow ‘unlawful killing’ verdicts at Inquests and officers responsible for those deaths should face criminal charges, even if retired. Implementation of police body cameras and cameras in all police vehicles in the interests of both the officers and the public. The end of means testing of families for legal aid. There is a lack of funds for family legal representation at Inquests whilst officers and NHS staff get full legal representation from the public purse – this is unbalanced. 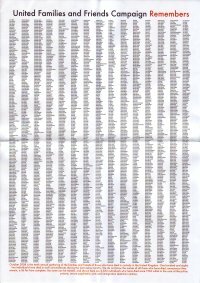 Bootnote See my earlier post, Deaths in custody, for links to reports and statistics on deaths in custody. The letter to David Cameron from by Marcia Rigg and Samantha Rigg-David on behalf of UFFC dated 2011-10-08, as well as Crispin Blunt's letter dated 2010-12-08 are available on the Sean Rigg Justice and Change Campaign website as well as the UFFC press statement dated 2011-10-29. A response from Nick Herbert dated 2011-12-07 has been posted on the UFFC website. Adam Elliott-Cooper wrote in Ceasefire Magazine Breaking News ‘Deaths in Custody’ March Attacked by Police. Peter Marshall illustrated and wrote on Demotix Families Protest Deaths in British Police Custody. Black Mental Health UK published reactions of some of the protestors in Outrage at deaths in custody march kettled by TSG police. 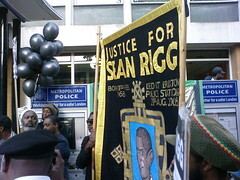 Ken Fero, the Met and an IPCC spokesman spoke to The Voice in Families Outraged Over ‘Police Manhandling’ During March. Linn Washington, Jr. wrote on This Can't Be Happening about the scourge ripping at the soul of this nation in Fatalities All Too Common: British Prime Minister Ignores Problem of Rampant Police Brutality. NoBorders includes a collection of links to pictures and videos at Indymedia London in March against Deaths in Custody. 4WardEver UK has detailed information on many of those who died and suffered abuse while in custody. In addition to supporting family campaigns, another action you can take is to volunteer as an Independent Custody Visitor (ICV). After joining an ICV panel in the borough where you live or work, your role is to make unannounced visits, with another ICV, to the police stations in the borough. During the visits you have chats with all the detainees that accept to see you (in their cells) and ensure that they have been informed of their rights, given the opportunity to talk to a solicitor, let someone know they are detained and have been treated fairly while in the custody suite. You can, and should, also check that the custody suite's CCTVs work, the showers have hot water, there's food available, etc. Any issue raised after a visit is answered by a senior police officer at the next panel meeting and further followed up if needs be. This scheme is statutory and managed by the local police authority, in London by the Metropolitan Police Authority. A limit of this scheme is that its remit is to look at the welfare of detainees only when they are in the custody suite. Having been an ICV for a year, I recommend readers consider applying to become independent custody visitors. The Independent Advisory Panel on Deaths in Custody has published a statistical analysis of all recorded deaths in state custody between 1 January 2000 and 31 December 2011, broken down by ethnicity, gender, age and cause of death. In total, there were 5,998 deaths recorded for the 11 years from 2000 to 2010. This is an average of 545 deaths per year. Of these deaths, 72% (N=4,291) were of males and 28% (N=1,676) were of females. A total of 607 deaths were reported in 2000 compared to 512 in 2010 (this represents a 16% reduction between the beginning and the end of the reporting period). Deaths of those detained under the Mental Health Act (MHA) and those in prison custody, account for 92% (N=5,511) of all deaths in state custody, at 61% (N=3,628) and 31% (N=1,883) respectively. 66% (N=3,974) of deaths were recorded as natural causes. Of these, 71% (N=2,814) of deaths were of patients detained under the MHA. 9% (N=553) of the 5,998 deaths were of individuals from Black and Minority Ethnic (BME) groups, with 5% (N=305) classified as Black, 3% (N=184) as Asian, 1% (N=52) as Mixed Ethnicity and 0.2% (N=12) as Chinese. 87% (N=5,192) were classified as White. Ethnicity was either not known, or not stated in 3% (N=180) of cases, 1% (N=76) were classified as ‘Other’. These figures need further analysis to understand whether there is any disproportion between race and ethnic identity and types of death. In 0.3% (N=19) of deaths, the application of restraint by custodial staff was attributed to the cause of death during the Coroner’s inquest. Update The Independent Police Complaint Commission also published a report Deaths in custody study last August. The research used completed investigations to gather data on all 333 deaths in or following police custody which occurred between 1998/99 and 2008/09.